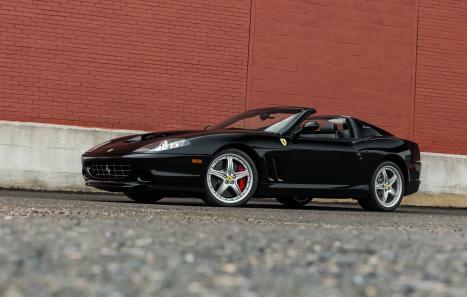 This particular Ferrari 575 Superamerica, chassis number ZFFGT61A150143323, is a 2005 model year with 38,684 miles from new and is finished in black (Nero) with black interior. 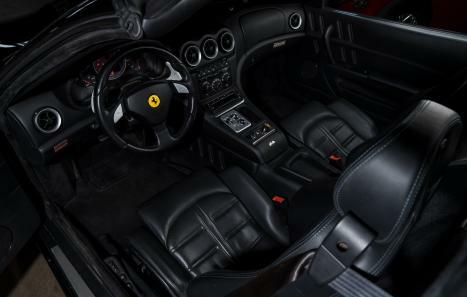 This car was optioned with the highly desirable GTC package (a $21,000 option) as well as ‘Scuderia Ferrari' shields and a high power hi-fi 6 CD changer. 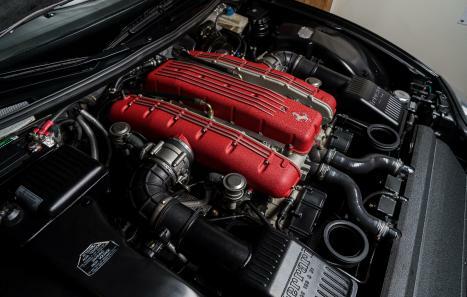 Despite the indicated miles, the car presents extremely well and has been maintained and cared for thoroughly. This Superamerica has a clean Carfax showing two previous owners. 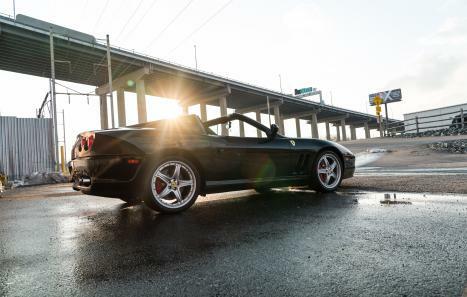 It was sold new out of Ferrari of Seattle, Washington and spent a bulk of its life there. During its first ownership, this Superamerica had the folding glass top replaced under warranty. There are numerous service records from its time in Seattle until it was offered for sale in January of 2016 with an indicated 35,802 miles on the odometer. The car was then sold to its second owner who resided in California. The second owner had the nose, and rear bumper correctly repainted (receipts present), and a clear bra installed. Both owners maintained fastidious service records during their ownership, all of which are included with the car. The car was always serviced at Ferrari Dealerships or certified shops and the records back this up. The vehicle is being offered with a fresh 30K service just completed, new tires and new factory windshield all of which was just completed by a very reputable shop with records to support the work. Included with the car are all the factory manuals and books, toolkit, air pump, service records as well as the original window sticker. Please visit www.LBILimited.com for many more photos and details. Worldwide shipping is available upon request. Follow us on Instagram and Facebook at @LBILimited.